The Number menu provides commands that create, calculate, and tabulate numeric values and that define functions in several different ways. Create parameters that you can set to different values, adjust, and animate within a domain you specify. Use the Calculator to derive new properties by calculating relationships between existing measurements. For example, choose Calculate to sum the measured interior angles of a triangle or compute the ratio of a circle’s measured circumference to its radius. 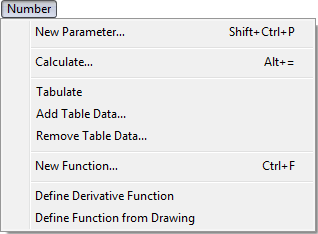 Tabulate values (parameters, measurements, and calculations) by hand, or automatically as the values change. Define a new function by entering its expression. The expression can include values in your sketch, an extensive set of built-in functions, and other functions that you define yourself. Define a function that’s the derivative of another function. Define a function based on the shape of a curve you draw with the Marker tool.